The all new MYDO Luck Shot range starts with the 1.7 ounce (42 grams) #1 – for casting and jigging in shallower waters, or to fish on the surface. It takes any plastic bait that completely comes to life when stuck onto the MYDO Luck Shot, an adaptation of the incredibly successful MYDO Bait Swimmer principles, designs and patents. These heavyweights are meant for saltwater deployment and are suitably armed with 7/0 to 9/0 Mustad O’Shaugnessy single hooks (or equivalent). Strong! And then we tested the internal wire rigging of the MYDO heads to 60kg’s! ‘Couta love the erratic, flailing action of the MYDO Luck Shot. When the ‘couta are around, best you fish the Luck Shot with wire, 7 strand or something resistant to teeth. The versatility of the MYDO Luck Shot also means you can just leave it out there on the drift. Skipjack seem to love this way of offering a lure, as the rolling motion of the boat is transmitted to the lure – resulting in a confused, jerky and erratic movement by the Luck Shot. Liam Gallagher hoists the very first fish caught on a MYDO LuckShot #2, earlier this year – this Sarda Sarda that took the new concept lure while the rod was stationery, in the holder, on the drift! 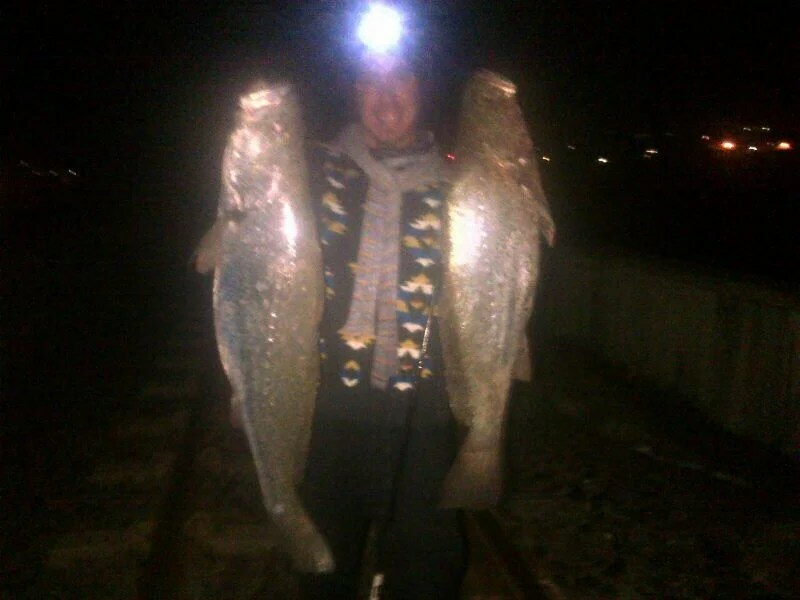 Casting into the surf at night is the best plan for shore anglers after the Daga Salmon. The weight of the MYDO Luck Shot # 2 is 42 grams, an ounce and a half of casting magic. The lure is then retrieved slowly, often dragging along the bottom, where the salmon see the sand and action and attack accordingly. A few jerks of the tip during the retrieve add to the flash and action and sand churned up – it’s an old technique refined. 6 inch Paddeltails or Trick Baits in lighter colours, especially translucent blues and whites, have produced the most fish at the Umzimkulu River mouth lately. 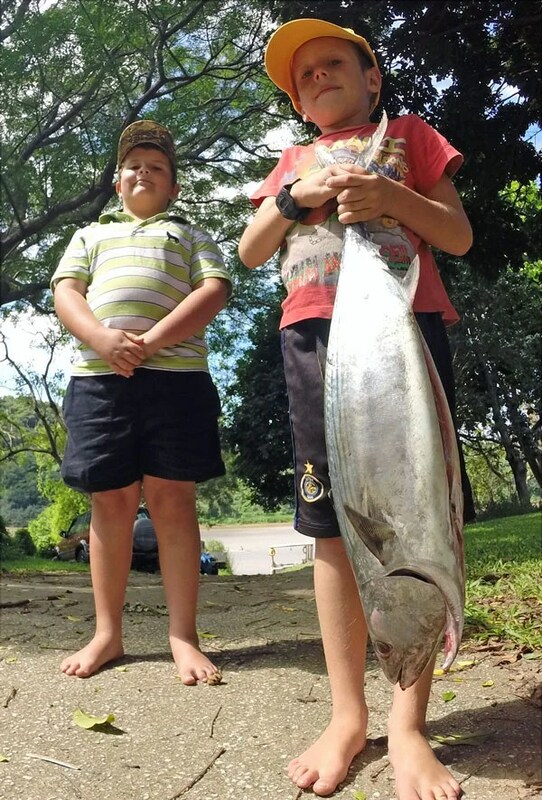 Dean Sinclair stoked with his Daga Salmon, caught fishing with Paddletail baits on The Sandspit in Port Shepstone. It’s great having such a versatile and adaptable rig going, and using the Luck Shot as a sinker when bottomfishing is a heap of fun. It’s like finally putting some intelligence into something so singularly deployed. Now all of a sudden, your sinker is a lure! And it works great for rockcod, as you can see from the product gallery. Adding flash seems to add to results, we are busy developing flashy skirts to add to the offering. Check under Superskirts soon.